The unit used to rate the Oxygen Radical Absorbance Capacity has become known as the ORAC value. With about 1068 ORAC units found in 30 mL (about one ounce) of Galaxy, you are getting approximately 21% to 36% of the daily ORAC units recommended by the USDA (Booth et al., 2012). This is an amazing score! Neither Juuva nor its distributors make health claims about Galaxy because it is marketed as a nutritional supplement, not as a medicine. Balick, Michael J. and Paul Alan Cox. 1996. Plants, People, and Culture. Scientific American 21 Library: New York. Booth, Gary M., Tory L. Parker, and Christopher M. Lee. 2012. Antioxidant, anticancer activity, and other health effects of a nutritional supplement (Galaxy®), pp. 3-20. In: Aymen Omer Eissa (ed. ), Structure and Function of Food Engineering. http://dx.doi.org/10.5772/1615. InTech, Rijeka, Croatia. Haytowitz, D.B. and S. Bhagwat. 1 2010. USDA database for the oxygen radical absorbance capacity (ORAC) of Selected foods, Release 2. Nutrient Data Laboratory, Beltsville 3 Human Nutrition Research Center (BHNRC), Beltsville, MD. Koch, A., P. Tamez, J. Pezzuto, and D. Soejarto. 2005. Evaluation of plant used for 13 antimalarial treatment by the Massai of Kenya. J. Ethnopharmacol. 101:95‐99. Parker, T.L., X‐H. Wang, J. Pazimino, and N.J. Engeseth. 2007. Antioxidant capacity and 23 phenolic content of grapes, sun‐dried raisins, and golden raisins and their effect on ex 24 vivo serum antioxidant capacity. J. Agric. Fd. Chem. 55:8472‐8477. Seeram, N.P., L.S. Adams, S.M. Henning, Y. Niu, Y. Zhang, M.G. Nair, and D. Heber. 2005. In vitro antiproliferative, apoptotic, and antioxidant activities of punicalagin, ellagic acid and a total pomegranate tannin extract are enhanced in combination with other polyphenols as found in pomegranate juice. J. Nutr Biochem. 16:360‐367. Silva, E.M., J.N.S. Souza, H. Rogez, J.F. Rees, and Y. Larondelle. 2006. Antioxidant activities and polyphenolic contents of fifteen selected plant species from the Amazonian region. Food Chem. 101: 1012‐1018. USDA Human Research Center on Aging. Feb. 1999. “Can foods forestall aging?” Agri. Res. Feb. 1999. Wang, Hong, Guohua Cao, and Ronald L. Prior. 1996. Total antioxidant capacity of fruits. J. Agric. Fd Chem. 44(3):701‐705. Yang, Meng, Sang‐Jin Chung, Chin Eun Chung, Dae‐Ok Kim, Won O. Song, Sung I. Koo, and Ock K. Chun. 2011. Estimation of total antioxidant capacity from diet and supplements in US adults. Brit. J. Nut. 106:254‐263. Acai, Pineapple, Red Grape, White Grape, Pomegranate, Red Raspberry, Acerola, Aronia, Cranberry, Goji, Mangosteen, Elderberry, Plum. Barley, Buckwheat, Flaxseed, Alfalfa, Wheatgrass, Garlic. Lactobacillus, Acidophilus, Alpha Lipoic Acid. Cayenne Pepper, Green Tea Leaf Extract, Soybean, Coenzyme Q10, Magnesium Stearate, Ascorbic Acid, Citric Acid, Xanthan Gum, Water, DMAE, Potassium Sorbate, Sodium Benzoate, Natural Flavor. Are there any artificial colors or preservatives added to Galaxy High Impact Blend? No. Galaxy High Impact Blend contains no artificial colors, preservatives or sweeteners. It does not contain high fructose corn syrup, and the sweet taste of Galaxy High Impact Blend is completely natural. Is there caffeine in Galaxy High Impact Blend? Yes. Galaxy High Impact Blend includes Green Tea Extract which is a naturally occurring form of caffeine. No artificial caffeine has been added. What is the expected shelf life of Galaxy High Impact Blend? Galaxy High Impact Blend has a complete two year shelf life for sealed bottles, however it should not be subjected to extreme hot or cold temperatures. How long can an opened bottle of Galaxy High Impact Blend remain fresh? 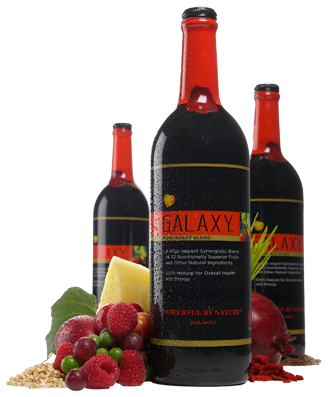 Galaxy High Impact Blend needs to be refrigerated after opening, which will maintain its nutritional efficacy and taste for up to 90 days. Is there a reason we have changed the caps on Galaxy? Yes! Galaxy will now have a metal cap that is crimped in place during the bottling process. This will provide improved protection against leakage and breakage. What is the sediment or froth in Galaxy? Sediment at the bottom of the bottle, and any froth accumulated in the neck of the bottle, is completely normal. These are actually part of the Superfruit and Superfood blends. Simply shake the bottle vigorously prior to use so as to fully benefit most Galaxy’s unique formula. Why does Galaxy taste different from time to time? Based on the season harvested, exotic fruit blends can vary between a slightly sweet to a slightly sour flavor. However the premier nutrient attributes and efficacy of each ingredient remains consistent, regardless of any variances in flavor.